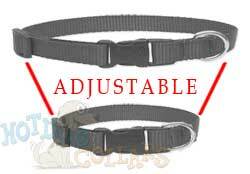 This collar is made to fit most adult Collie. So just measure your dogs neck and confirm that it fits within the range below. No need to worry about selecting a size! Choose your colors, enter your custom text, add an artistic icon, and we'll take care of the rest. Personalized Celtic Collar Made in the USA by Yellow Dog Design, Inc.